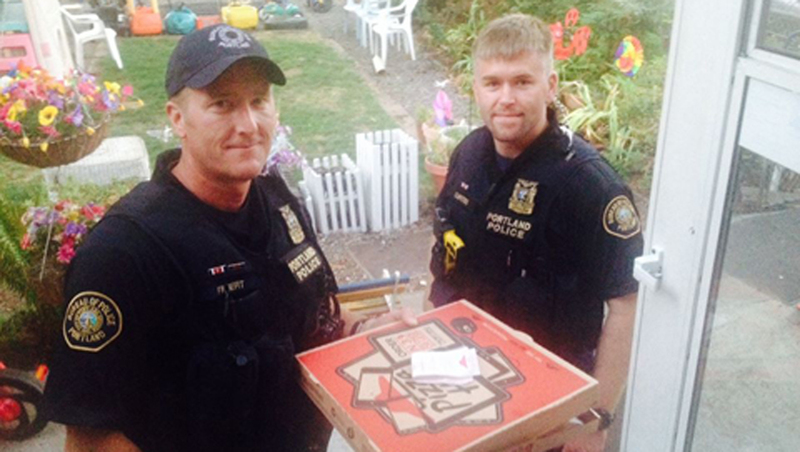 PORTLAND, Ore. - Two Oregon police officers recently made a special delivery: a pizza. Here's how their fast-food run unfolded, according to CBS affiliate KOIN. When the delivery was delayed, Huckins' wife called the Pizza Hut. "So [my wife] goes, 'well we didn't get the pizza,' so [the manager] says, 'well we'll make one and I'll hand deliver it and give it to you for half price," said Huckins. The manager was good to his word - he personally delivered a pizza to the Huckins' door. They were just sitting down to eat, when - another knock at the door. The one they had ordered in the first place. Huckins and his wife were... well, they say they were shocked. "They turn around to leave, and I said, 'whoa, whoa, whoa - I got to get a picture of this. No one is going to believe Portland police delivering a pizza.' So that's the picture everyone saw," Huckins said. The photo Huckins snapped of the two officers went viral. Huckins said he wanted to thank the two cops-turned-delivery men -- Michael Filbert and Royce Curtiss -- for going out of their way to make a special delivery. "I wanted these officers to get a little recognition because these officers went above and beyond," Huckins said.